Join us for our very first book swap! 📚 Make space on your shelves, support the shul, and get some quality reading for the end of the summer and chagim. Drop off books from now through August 17th, and come August 19th to grab some great new-to-you books! 1. DROP OFF: Between June 11 and August 17, drop off gently used books at 10-01 Bellair Ave. Include a note with your name and email address. 2. 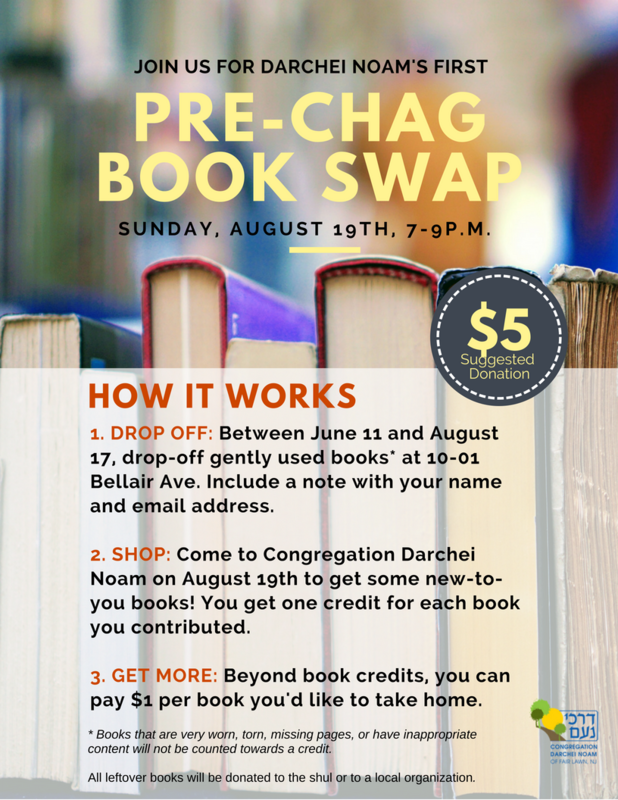 SHOP: Come to Congregation Darchei Noam on August 19th to get some new-to-you books! You get one credit for each book you contributed. 3. GET MORE: Beyond book credits, you can pay $1 per book you'd like to take home. It's incredible how many books have been donated to the book swap so far! There are so many books, we are now asking that people drop-off *no more than 10 books* for the swap. Additionally, *we need volunteers* to help bring the books to the shul by car (from around the corner) and then sort them at the shul, beginning at 5pm on Sunday, August 19th. If you are able to volunteer, please email Faigy Gilder at faigygilder@gmail.com.